In celebration of Black History Month, Disney Junior will debut “We Are Doc McStuffins” interstitials featuring Doc McStuffins, a young African-American girl who aspires to be a doctor like her mom, alongside three real life female African-American physicians sharing what their jobs entail, and saluting their heroes. The interstitials will begin airing on Disney Channel and Disney Junior on FRIDAY, FEBRUARY 1 (10:25 a.m. ET/PT and 4:25 p.m. ET/PT, respectively) following a new “Doc McStuffins” Valentine’s Day themed episode. Additional interstitials featuring the three doctors will begin rolling out in the spring and will air regularly on both platforms. Since its March 2012 premiere, “Doc McStuffins” has garnered worldwide attention for its portrayal of a young girl who runs a clinic for her stuffed animals and toys out of her backyard playhouse. 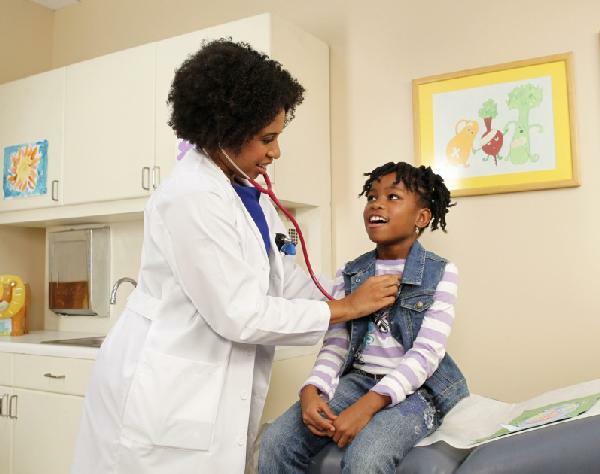 Additionally, the series inspired a group of female African-American physicians to begin a “movement” they coined, “We Are Doc McStuffins.” Seeing a reflection of themselves in the Doc character and the opportunity to inspire young girls, the group grew to form the Artemis Medical Society, an organization of over 2500 female African-American physicians and medical students from around the world. The interstitials feature three of the founding members of the “We Are Doc McStuffins” movement – Dr. Myiesha Taylor, an emergency doctor based in Dallas; Dr. Aletha Maybank, a pediatrician in New York City; and Dr. Naeemah Ghafur, a family doctor in Los Angeles who provides specialized care for the underserved, including the elderly and patients with high-risk illnesses. “Doc McStuffins” ranked as 2012′s #1 cable TV series in Kids 2-5 and the #1 preschool cable TV series in Total Viewers and Women 18-49. The series stars the voices of Kiara Muhammad as Doc; Loretta Devine as Hallie; Lara Jill Miller as Lambie; Robbie Rist as Stuffy; Jess Harnell as Chilly; Jaden Betts as Donny McStuffins; Kim Brooks as Mom McStuffins; and Gary Anthony Williams as Dad McStuffins. The series’ theme song is performed by the star of Disney Channel’s hit series “A.N.T. Farm” and Hollywood Records recording artist, China Anne McClain. Created and executive-produced by Humanitas Prize and Emmy Award-winning Chris Nee (writer on “Little Bill” and producer of “Deadliest Catch: Crab Fishing in Alaska”) and directed by Emmy-winning Norton Virgien (“Rugrats”), “Doc McStuffins” is a production of Dublin, Ireland’s Brown Bag Films in association with Disney Channel. The Hollywood Health & Society division of the USC Annenberg Norman Lear Center serves as its health and medical consultants, advising on basic health issues that are relevant to young kids and families. Disney Junior reflects the emotional connection generations of consumers have to Disney storytelling and Disney characters, both classic and contemporary. It invites mom and dad to join their child in the Disney experience of magical, musical and heartfelt stories and characters, while incorporating specific learning and development themes designed for kids age 2-7. Disney Junior’s series blend Disney’s unparalleled storytelling and characters kids love deeply with learning, including early math, language skills, healthy eating and lifestyles, and social skills. Disney Junior launched in February 2011 with a daily programming block on Disney Channel. In its first year, Disney Junior posted the network’s biggest yearly audience in the daypart in Total Viewers, Kids 2-5, Boys 2-5 and Women 18-49, increasing by double-digit margins among preschooler demographics over year-ago levels. On March 23, 2012 Disney Junior added a cable and satellite channel in the U.S. Disney Junior channels in Japan, India and Disney Junior Portugal launched in fall 2012, bringing the total number of channels to 33 worldwide.